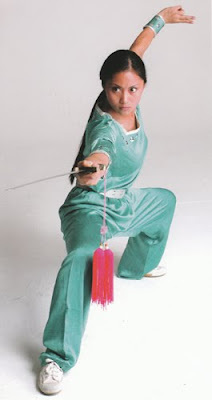 Born in Nanjing, I started practicing Wushu (chinese martial art) at an early age. As a member of the Jianxu Wushu team, I won several national and world-wide martial art competitions, including a Gold Medal for China. I moved to the U.S in 1995, and competed for Team Paul Mitchell in the North American Sport Karate Association (NASKA) for 5 years. I was awarded the 1999 Black Belt Magazine’s Competitor of the Year. My big break in Hollywood came when I had a chance to double Nia Peeples in Walker: Texas Ranger. After that, I was lucky enough to land several roles in high profiles films such as Charlie’s Angel, Kill Bill , Mission Impossible 3 , Die Hard 4 , the recently released Gi Joe 2: Retaliation and the upcoming TV show Agents of S.H.I.E.L.D . In 2010, I was honored by the Diamond in the Raw foundation for my work as a stuntwoman. Nowadays, I divide my time between working here (i'm based in Los Angeles) and in Asia. I also continue to be involved in Wushu as an instructor. Please take a moment to take a look at my latest action reel, read some recent news or drop me a line! Thanks, and welcome to my OFFICIAL WEB SITE!